Hey everybody, Dr. Jannine Krause here. I am here to demo a couple of moves that you can do to work on pain that you might have in your neck or your upper back. All too often I see people coming into my office with their shoulders kind of slumped forward and their neck sticking out. If you look like this its like this (shoulders rolled forward) and the neck forward. Why? Well, you know. A lot of us have things like cell phones, we’re sitting at computers all day and so we’re doing this kind of thing (holding cell phone and leaning forward) and not even realizing what were up to. Plus, if we have a stressful lifestyle, we do tend to kind of, what I tell my patients, we turtle a little bit so we kind of tuck our chin and move (the chin) forward and then we also have this kind of forward rotation (of the shoulders) thing going. You can see how that would cause neck and shoulder pain and so if you roll your shoulders back and bring your neck back it seems like you’re in somewhat of a stiff position but actually that is proper posture and doing this every time you notice your shoulders forward and your chin going forward. Keep reminding yourself it takes time to form that good healthy posture habit. 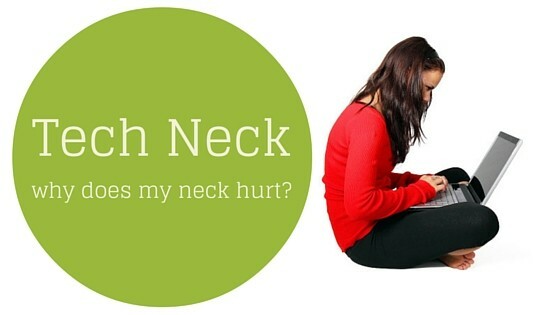 If you keep doing that that’s going to help you to work on your neck and upper back pain. The other thing that I recommend is some mobility work and so one of the big things is really rolling the shoulders (demonstrating rolling shoulders back one at a time) like so, helps big time and loosening them up. (Shoulder demonstration) you do back you do forward (rolling the shoulders), the other thing that I also recommend is something that I’m stealing from Cody Storey on Daily Burn and so there’s a nice shout out to Cody and so back and forward this is called a pop and the shoot. It works amazing for helping to open up the back and the thoracic cavity there, so is the pop and the shoot for that back. So hey you know what, roll your shoulders back roll your shoulders forward roll then back officially put that chin back and these are ways to help with that neck and back pain and if you pay attention and you work on this every single day you’ll eventually develop a habit so that you’re walking around with proper posture all the time and you’ll get rid of all that neck and back pain I’m Dr. Janine Krause and this is my little series on working on neck and back pain thanks for watching.